This time switch is used for controlling appliances depending on real time, that is synchronized by a DCF 77 signal. The time switch SHT-6 has the holiday mode, the mode with shuffle switching to simulate presence in the house. It is also possible to set a time (pause) to turn off which brings significant energy efficiency. 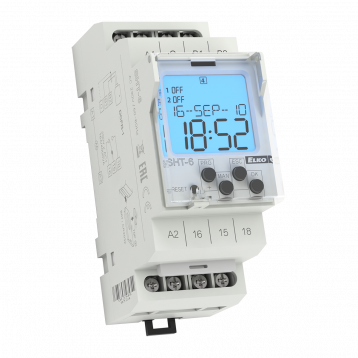 Automatic switching between winter/summer time. 4 types of settings – auto/manual/random/holiday mode. Power voltage AC 230 V.
Reserve battery for up to 3 years. Output contact: 1x changeover 8 A (AgSnO2). 2-MODULE, mounting on DIN rail.